There are plenty of reasons why you'd go out of your way to grab a pint of Ben & Jerry's. Maybe it's to satisfy a days-long craving for Phish Food, or to sop up the sadness of a bad breakup. Or, perhaps, you're just curious what cookies baked from chunks of its cookie dough would taste like. Though, if it's because you want to throw your support behind a good cause, that's a solid reason now too, thanks to the flavor-crazy ice cream brand's new offering. The new, limited edition flavor was created in an effort to protest against what the company describes as the Trump Administration's "regressive agenda." 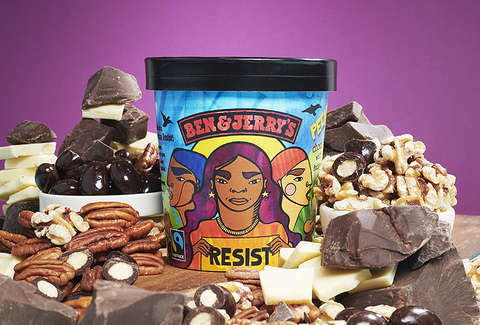 The new flavor, dubbed Pecan Resist, is the latest limited-batch run from the famously progressive company, and is inspired by a new campaign its kicking off to help push back against injustice and champion activists who're fighting to resist the current administration's agenda. Specifically, the new pint's packaging features a design that outlines the mission to "honor & stand with women, immigrants, people of color, & the millions of activists and allies who are courageously resisting the President’s attack on our values, humanity & environment." In addition, Ben & Jerry's is pledging $25,000 each to four different organizations committed to such activism, and encouraging fans to sign up and learn more about them. As for what the dairy treat tastes like, it's a blend of chocolate ice cream with white and dark fudge chunks, pecans, walnuts, and fudge-covered almonds. If that sounds familiar, it's because in a previous incarnation, it was known as New York Super Fudge Chunk. To get your hands on some, pints are available via the company's online store and will soon be coming to the brand's participating scoop shops. Otherwise, its set up a special web page where you can learn more about the initiative.